It’s an oppressive, sweltering summer night in a sleepy southern town in a secluded part of Mississippi. Sparta is a typical rural town in the heart of the Jim Crow South, which means that the whites rule the roost and the colored folk know their place. As deputy Sam Wood (Warren Oates) is making his nightly rounds after hours, he drives through an alley between two stores and comes upon a body lying on the side walk. At first, he thinks a townsman has had a little too much white lightning and has passed out, but when he reaches down to touch the body and notices blood on his fingertips, he realizes that Sparta has its first murder case. After informing his superiors about the crime, he goes in search of the would-be killer. When he arrives at the train depot, he notices a nattily dressed, young colored man sitting inside. Being raised in the shadow of the KKK, Officer Wood instantly surmises that this ‘black boy’ must be the perpetrator of this heinous crime. When he searches the man, he notices a hefty sum of money in his wallet and this seals the young mans fate as the guilty party. With the prisoner in tow, Officer Wood places the accused before his hard-lined boss, Sheriff Bill Gillespie (Rod Steiger). When Gillespie interrogates the young man, he too believes that they have the right man in custody. But when he questions the stranger about the money in his wallet, he is suddenly drained ashen white when the young man reveals that he earned the money as a police officer in Philadelphia. 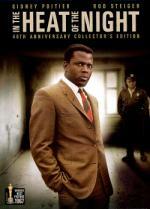 When Gillespie calls the officer's commander back in Pennsylvania, he learns that the man he has under arrest for murder, is actually Philadelphia’s finest homicide detective, Virgil Tibbs (Sidney Poitier). Both men will be put into an uneasy and embarrassing situation when Tibbs’ boss offers Sparta the services of their finest homicide man to help solve the crime. At first, Gillespie politely refuses the offer as unnecessary and that the case will be solved in due course by his staff. But with hindsight being 20-20, he realizes that it wouldn’t hurt if Tibbs at least looked at the body. Further complications will arise when the dead mans wife (Lee Grant), witnesses an altercation between Tibbs and Gillespie over the alleged guilt of a man that is in custody and who was found with the decedent's wallet. When she sees the level of bigotry directed at Virgil, she insists that he stay on the case as Tibbs seems to be the only man in town with any sense of reliability. This sets the stage for the clash between Virgil and the locals as he pursues the killer and sets his sights on the richest man in town. This situation also forces Gillespie to walk a tightrope between loyalty to a town that wants to lynch Tibbs and keeping his law enforcement integrity by helping Virgil solve the case. As the drama unfolds, each officer’s role will be reversed as an inner prejudice surfaces in Tibbs’ personality as he doggedly tracks down his aristocratic quarry, while Gillespie forsakes his own standing in town to insure that his commitment to law enforcement is not compromised or abridged. When it was released in 1967, no one associated with the production could have dreamed that the film would make such a big splash at the box office or at the Academy Awards. But with racial tensions flaring up across the country, the film touched a nerve with mainstream American audiences who could see firsthand, a microcosm of the widespread problem bubbling under the surface in our society. When Oscar time rolled around, In the Heat of the Night would be rewarded with a Best Picture award and Best Actor for Steiger’s performance. With the quality of the competition it faced at the award ceremonies, it stands as a testament to the effects of film as a guiding and moving force in societal evolution. I like this film a lot. I had it in good memory from watching it when I wasw fairly young and it held up extremely well upon rewatching it not all that long ago. When I first saw it I had way less understanding of the situation portrayed in the film. Rod Steiger's performance is great, with Sidney Poitier not far behind. The story is not so new anymore (unfortunately not entirely outdated) but it must clearly be seen as a product of its time.